Skoda is thinking to bring apart from its Kodiaq and compact Karoq, the smaller version of both cars at the Geneva Motor Show 2018. The company has revealed some information about this car which is based on the Vision X Concept which introduces the company’s perspective for a model range along with hybrid technology. Skoda mentions it as an 'urban crossover' and the new car gets some of the features of the successful SUV variants of the company in this vehicle segment. 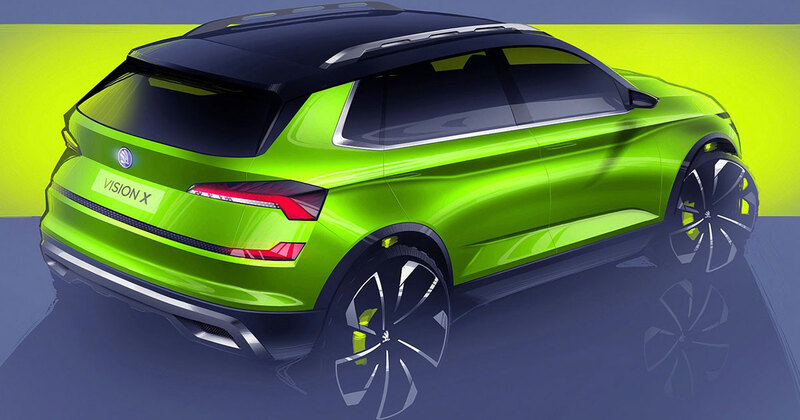 The Vision X Concept of the Skoda is compact in all respect to the FlexGreen-painted exterior and forces us to have a look at it and at the same time reminding us the Hyundai Kona. The roof is equipped with a contrast Anthracite mentioning sporty accents and the other details include a panoramic glass roof, side sills, the distinctive bumpers and 20-inch alloy wheels. Coming to the cabin, it covers a completely new design to adapt on. It has the infotainment system, a big touchscreen, connectivity services, ergonomically contoured dashboard and freestanding color display in the cabin. The Vision X will be 3rd in the lineup from the company's SUV family and is expected to be the first SUVs from the company accommodated with a hybrid powertrain. The Vision X variant is expected to launch in March this year.